Last June, Nongshim Shin Ramyun hit shelves of 4,692 branches of Walmart through the US all at once. This unprecedented event in the Korean food industry evidenced the brand power of Shin Ramyun on the global stage. All the brands that Walmart sells nationwide are global names: Coca-Cola, Nestle, Pepsi, Kellogg’s, and Heinz. Nongshim Shin Ramyun and its uniquely Korean-style spiciness has proven its worth by standing shoulder to shoulder with global brands on US shelves. Boosted by this global recognition, accumulative sales revenue for Shin Ramyun is now near KRW 12 trillion (USD 10.6 billion). The accumulative number of units sold is around 30 billion. Nongshim Shin Ramyun is the only Korean food label that’s managed to export to 100 countries with just a single product. As a pioneer in the Korean food wave exporting Korean flavor to over 100 nations, it has essentially become a cultural ambassador. This boost in global recognition contributed to Nongshim Shin Ramyun getting on the list of Top 10 Brands Representing Korea Overseas. It was the only food product brand on the list. On top of being the first Korean food product to be sold in Walmart branches all across the US, Shin Ramyun has also expanded its name recognition by establishing itself on in-flight menus for various airlines around the world. After 30 years on the Korean market, Shin Ramyun has transformed from the “ramyun that makes men cry” into the “ramyun that makes the world cry.” Made in Korea but eaten around the world, Shin Ramyun now brings in an annual revenue of KRW 700 billion (USD 618.25 million) from domestic and overseas sales, writing a new narrative in the Korean food wave. Now known as the “semiconductor of the food industry,” Shin Ramyun has now become a quintessential Korean export, over 30 years after it was first exported in 1987. Back then, Nongshim selected Japan for as its first export market due to Japan’s symbolic status as the fatherland of ramen.After exporting to retailers in major cities like Tokyo and Osaka, Nongshim established its sales division Nongshim Japan in 2002, signaling its intent to establish itself in the Japanese market. At first they focused on increasing their sales, then they adopted a customer-friendly strategy by setting up promotional sample booths. The strategy of boosting brand power through overseas sales worked, and revenue steadily increased after the company’s Japanese expansion. Another factor that boosted Shin Ramyun’s rise in Japan was the Shin Ramyun kitchen car. A food truck project launched in 2013 to allow customers to try Shin Ramyun for themselves, the Shin Ramyun car was a great success, and in 2014 started travelling around Japan as an unofficial ambassador for Korean ramyun. For seven months of every year, in the spring and fall, the Shin Ramyun kitchen car brought Korea’s brand of spice to key Japanese cities. In the end, the kitchen car covered 10,000 kilometers and took part in over 150 taste testing events. Regarding the project’s success, a Nongshim employee said, “For a Korean ramyun brand to lay down roots in the fatherland of ramen, against such fierce competition, is very significant,” adding that the company was going to continue aggressively expanding through marketing campaigns. Shin Ramyun is now exported to over 100 countries, including the US, Japan, China, China, Australia, and nations through Southeast Asia, Europe and Africa. In short, it’s easier to find a place where you can eat Shin Ramyun than it is to find a place where you can’t. The brand is a thriving example of private diplomacy all over the world, from neighboring countries like Japan and China to the Swiss peak of Jungfrau, the top of Europe; the Islamic countries of the Middle East, where Korean exports had little to no success prior; Himalayan trekking courses in Nepal; and Chile’s Punta Arenas, one of the world’s southernmost cities. Locals around the world saying “I don’t much about Korea but I know Shin Ramyun” is a testament to the brand’s global popularity. And it’s not just in iconic landmarks. Shin Ramyun is now sold in places Koreans would have never imagined before. What’s particularly notable is that Shin Ramyun’s popularity is skyrocketing in China and Southeast Asia, well-developed noodles cultures that comprise the largest instant noodle market in the world. But at the base of such success is, surprisingly enough, tradition. In the beginning, product developers focused on recreating a type of spicy beef broth popular among Koreans, thereby forming a base of optimal spiciness that would become Shin Ramyun, a blend of flavors based on traditional Korean marinades that would go on to take the world by storm. Based on a beef broth and a marinade of minced spices, Shin Ramyun’s flavor distinguishes itself from the run-of-the-mill spiciness, and has even inspired the appraisal, “Some people may have never tried it, but nobody’s tried it only once.” This is the secret behind the brand’s global success. But Shin Ramyun didn’t instantly conquer the global export market from the very beginning. Although China is currently one of the brand’s biggest markets, when the brand first tried exporting to China in 1996, the wall to the world’s largest instant noodle market was as formidable as the Great Wall of China. Back then, Chinese consumers weren’t in the habit of cooking instant noodles in boiling water over a stove; instead, they’d simply put noodles in a dish and pour hot water over them, similar to how one prepares instant cup noodles. This was partially due to a highly developed tea culture. Changing the habits and perceptions of Chinese consumers was impossible in the short term. Therefore, Nongshim launched a marketing campaign in Chinese supermarkets, offering samples under the slogan, “Ramyun is best when cooked over a stove.” Finally, the walls of habit and prejudice broke down, and Chinese consumers were won over. The trials and tribulations Nongshim endured to break through the Southeast Asian market are now an essential component of the brand’s smart marketing. With countries with a relatively underdeveloped modern distribution network, such as Vietnam and the Philippines, the brand finally saw sales increase after dropping its strategy of targeting large supermarkets and going after discount shops, local grocery stories, and traditional markets scattered through the country. “Unlike electronics and beauty and fashion products, the Korean Wave for food products is a longterm phenomenon. Because every country has its own indigenous food culture, it’s not easy for food from another country to establish itself in a foreign place. Therefore, the Korean food wave is something that seeps into a country slowly, which requires a long-term market strategy.” Nongshim staff members say that persistence and curiosity for a country’s food culture is required for exporting food products there. Shin Ramyun’s global popularity has literally reached the skies. Since establishing itself as a supplier for domestic airlines in the first half of last year, Nongshim is now being scouted by airlines around the world. Nongshim now supplies Shin Ramyun to 20 overseas airlines. Because planes can only carry a limited amount of food, they only select products that are universally liked around the world. Last year, Nongshim formed its first partnership with a Latin American airline by agreeing to supply Shin Ramyun to Aeromexico. Travelers flying with European airlines such as LOT Polish Airlines and British Airways have left online reviews commenting on how Shin Ramyun is now available, ushering in a new era of ramyun in the sky. Shin Ramyun is being offered on more in-flight menus as time progresses. Previously, it was only offered on flights to and from Korea, but it is now offered on various international routes unrelated to Korea. A buyer from United Airlines commented, “In-flight menus for international flights need to offer items that are going to be universally liked around the world.” Today, travelers are enjoying the spices of Korea 30,000 feet in the air. Ramyun is not only hot offline, it’s also hot online. 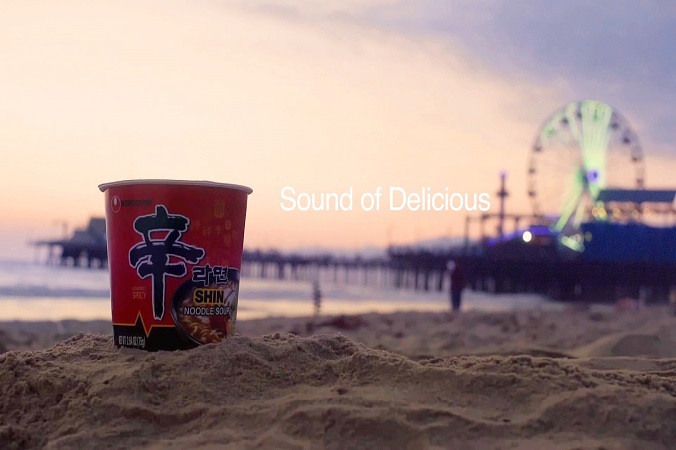 Shin Ramyun has once again proven its global popularity via a marketing video based on sound. Released on YouTube on December 20, 2017, “The Sound of Delicious Shin Ramyun” is a fun ad based on the theme of the sounds people make when making and enjoying their ramyun. The video cleverly mixes the sounds of the knife against the cutting board, chopsticks banging against the pot, and the slurping of people enjoying the fruits of their labor, inspiring comparisons to a Nanta performance. The production team actually filmed people eating Shin Ramyun in locations like Santa Monica beach, Hollywood, downtown Los Angeles, and Yosemite National Park while camping, partying, and going about their daily lives. Nongshim USA and YouTube co-produced the video, which attracted global attention by getting over five million views. Starting in January 2019, viewers will be able to see a video shot in Arkansas International Airport in Bentonville based on the theme “You, me, we all love Korean spice.” Shin Ramyun, Korean spice, has firmly established itself as the emperor of instant noodles by winning over taste buds around the world, proving that the most Korean things can also become the most global things. A hot, spicy and new splash of the Korean Wave. ▲ PrevJang Jin-eun, tour manager & CEO of Good People, runs the show behind K-pop’s rise on the global stage.